Portrait of a lady, possibly Lady Amy Dudley nee Robsart (1532-1560). The death of Lady Amy Dudley nee Robsart on 8 September 1560 has generated considerable controversy. What led to the death of this prosperous gentlewoman, discovered at the bottom of a flight of stairs in Cumnor Place, Oxfordshire? 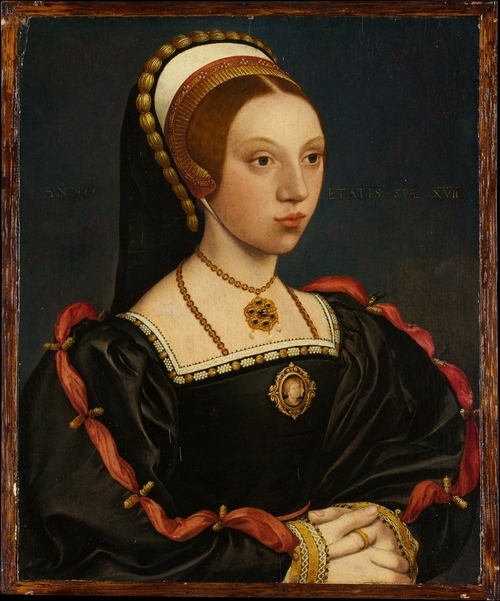 The only child of Sir John Robsart, Amy married the wealthy and successful Robert Dudley, son of the Duke of Northumberland, in 1550 aged eighteen. Rumours circulated at the time and have intensified in modern times that the couple's marriage was unhappy, prominently because of Robert's close relationship - some believed love affair - with the Princess and later Queen Elizabeth. An impenetrable mystery surrounds the circumstances which caused Amy's death, although there are several possible explanations: suicide, cancer, murder (by either the Queen's agents, Dudley's agents, or Cecil's agents) or, simply but tragically, an accident. For an enjoyable - if taken with a pinch of salt - fictional take of Amy's relationship with Robert and her eventual death, readers should consider reading Philippa Gregory's The Virgin's Lover. First, let us begin with the facts. 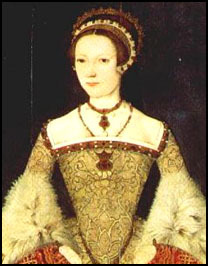 Amy Dudley, despite being the daughter-in-law of a duke (later disgraced), did not accompany her husband Robert to court in 1559 when he served the new Queen, Elizabeth I, as her faithful courtier. She seems to have spent her time travelling around the country and visiting family friends, while she seems to have enjoyed spending money on clothes from London. We do not know the personal details of Robert and Amy's marriage. In an age in which marriages between the gentry and aristocracy were arranged for social, material and political advantage, individual couples did not prioritise finding happiness or love in marriage, although of course it was beneficial when this did occur. The couple had no children, yet we do not know whether this was due to fertility problems or whether it was because the couple were often separated. Rumours have circulated that Dudley enjoyed a love affair with Queen Elizabeth, scandalously conveyed in Gregory's novel, yet again, we lack any real proof to fully substantiate this claim. However, courtiers did mention that for over a year before Amy died, the queen and her favourite had merely been waiting for Amy to die so that they could marry. It is plausible, however, that Robert and Amy's marriage was not entirely happy. They were often separated, had no children, and since many believed after Amy's death that Robert had actually murdered his wife, it seems credible to argue that contemporaries were aware that the marriage was somewhat difficult. After the summer of 1559, Robert never saw Amy again. would not that day suffer one of her own sort to tarry at home, and was so earnest to have them gone to the fair, that with any of her own sort that made reason of tarrying at home she was very angry, and came to Mrs. Odingsells ... who refused that day to go to the fair, and was very angry with her also. Because [Mrs. Odingsells] said it was no day for gentlewomen to go ... Whereunto my lady answered and said that she might choose and go at her pleasure, but all hers should go; and was very angry. They asked who should keep her company if all they went; she said Mrs. Owen should keep her company at dinner; the same tale doth Picto, who doth dearly love her, confirm. Certainly, my Lord, as little while as I have been here, I have heard divers tales of her that maketh me judge her to be a strange woman of mind. Perhaps suspiciously, she was later described as being angry when her three servants resisted her desire that they leave. Later that day, she was discovered at the bottom of a flight of stairs with a broken neck and two head wounds. So what caused Amy's death? Firstly, this article will consider the modern explanation of Amy suffering a malady in her breasts which caused her death. It was assumed at the time of the death in 1560 that a simple fall could not have caused Amy's death - there were not particularly many steps as it was a short flight, while Amy's headdress was described as still remaining perfectly undisturbed on her head. In 1956, Ian Aird proposed this theory, arguing simultaneously that "a verdict of misadventure, in the case of accident, [is] not easily acceptable". Aird's profession as a professor of medicine undoubtedly aided him in putting forward the theory that, rather than suicide, accident or murder, Amy was suffering from breast cancer and so may have meant that her neck was particularly fragile and could break easily. This theory has become somewhat popular in modern times. As he noted: "in a woman of Amy's age the likeliest cause of a spontaneous fracture of the spine would be a cancer of the breast..." Indeed, the Count of Feria reported in April 1559 that Amy Dudley "had a malady in one of her breasts". When one reads Aird's article, his argument that Amy's death resulted from a fall down the stairs, which was worsened than it would otherwise have been by a weakened spine caused by breast cancer, his viewpoint is compelling. Yet it has been attacked. Simon Adams, for instance, asserts that "this theory accounts for a number of the known circumstances, but a serious illness in April 1559 is difficult to reconcile with her extensive travelling in the following months". An alternative explanation is suicide. If she was suffering illness or depression, even potentially breast cancer, this may have led her to commit suicide in an attempt to escape a life no longer bearable. This can be supported by evidence of her "desperation" in some sources, while some historians have put forward the hypothesis that Amy sent away her servants on the morning of 8 September in order to commit suicide secretly. Robert Dudley himself may have alluded to this possibility. 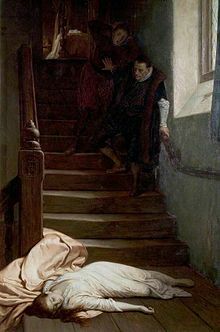 However, Aird attacked this view, stating that "to project oneself down a flight of stairs would not occur to a suicide now, and would have occurred even less to an Elizabethan suicide at a time when the steps of staircases were broad and low, and the angle of descent gradual". Furthermore, it is difficult to believe that, if Amy killed herself, her headdress would still have remained upright on her head when she would not have been able to do this if she was dead by the time she fell to the bottom of the stairs. Others have suggested that Amy's death was accidental. James Gairdner, in 1898, suggested that her death was a tragic accident. The coroner's verdict in 1561 was that Amy Dudley, "being alone in a certain chamber... accidentally fell precipitously down" the stairs next to the chamber "to the very bottom of the same". This caused two head injuries and injuries to one thumb. Tragically, she had broken her neck in the fall. Because of this, she "died instantly... the Lady Amy... by misfortune came to her death and not otherwise, as they are able to agree at present". However, historians have suggested that Robert Dudley, as an influential and powerful courtier, was able to influence the jury. Aird has argued that "there are several circumstances in relation to Amy Robsart's death which made her contemporaries, and which have made the historians of later times, a little hesitant to accept unreservedly the jury's verdict of misadventure". Perhaps most famously, it has been theorised that Amy was, in fact, murdered. Following her death, there was "grievous and dangerous suspicion, and muttering" in both court and country, as people murmured about Amy's death and the renewed relationship between the Queen and her favourite, Dudley. William Cecil, who was Principal Secretary and who has been argued felt threatened by Dudley's increasing influence, informed the Spanish ambassador in the aftermath of Amy's death that Elizabeth and Dudley had been plotting to murder Amy by poison, "giving out that she was ill but she was not ill at all" (which somewhat contradicts the evidence put forward earlier that she was ill). In 1567, Amy's half brother John Appleyarde, in irritation with Dudley, stated that he "had not been satisfied with the verdict of the jury at her death; but that for the sake of Dudley he had covered the murder of his sister". Contemporary evidence raises the possibility that Amy was murdered. The discovery of the contemporary Spanish ambassadors' correspondence in the nineteenth century supported the theory of murder, reporting that Amy was ill and her husband had been trying to either poison or divorce her as early as the spring of 1559. The report from 11 September 1560, three days after Amy's death, states that Cecil believed that Dudley had murdered his wife. A 1563 chronicle, written by someone violently hostile to the Dudleys, suggested that Robert Dudley's retainer, Sir Richard Verney, murdered Amy by breaking her neck (this is fictionalised in The Virgin's Lover). Catholic exiles wrote the satirical Leicester's Commonwealth in 1584 and, hostile to Dudley, suggested that Verney sent Amy's servants to the market when he arrived at Cumnor Place before breaking Amy Dudley's neck and placing her at the bottom of the stairs. The Victorian historian James Anthony Froude, having found the Spanish ambassadorial correspondence, wrote in 1863 that: "she was murdered by persons who hoped to profit by his elevation to the throne; and Dudley himself... used private means... to prevent the search from being pressed inconveniently far". Alison Weir, in 1999, suggested that Cecil, rather than Dudley, arranged Lady Amy's death because he had a murder motive, ie. to prevent Dudley's potential marriage to his mistress, Elizabeth I, and because Cecil would benefit as a result of the scandal. Other evidence has been put forward: considerable time before Amy did die, both Robert and the Queen predicted to the Spanish ambassador that she would shortly die. However, many historians have discredited rumours that Amy was murdered. Dudley's correspondence with Thomas Blount and William Cecil in the preceding days has been seen as evidence that he was innocent, while others have noted that both he and Queen Elizabeth were highly shocked when news of Amy's death were brought to them. It has, plausibly, been suggested that he would not have had his wife killed because of the tremendous scandal that would ensue if he were implicated in his wife's murder. David Loades went so far as to state that "we can be reasonably certain that Lord Robert had no hand in his wife's death". Aird states that there "was no evidence that he [Dudley] had any thought of murdering his wife" even if he did wish to marry the Queen. He also asserts that "a staircase [is not] a convenient weapon for murder. To throw a person downstairs is too uncertain", it cannot be argued that "she was first murdered by some extreme violence and then thrown downstairs". Historians have also recognised that poison was a "stock-in trade accusation" in the sixteenth century to discredit political rivals and the fact that sources support one another in suggesting Amy was murdered was "no more than a tradition of gossip". As Catholic sources, and thus hostile to both Queen and Dudley, we should consider them very cautiously and sceptically. To conclude, I have to admit, personally, that I know too little about these mysterious events to put forward my belief of what actually happened on that day. I can only say, however, that it was very suspicious. Why did Amy send away her servants on that particular day? Was it because, to put it nicely but bluntly, she was going mad or even insane due to her illness; was it because she wished to be alone to commit suicide, or was it for some other reason? Why did the Queen and Dudley hint to the Spanish ambassador that Amy Dudley would soon die - was it because they knew she was fatally ill, or is it evidence of murder? Almost all of the sources we have about this event are highly suspect. Thus we cannot conclude with any real certainty about what happened. I have suspicions, however. Aird has discredited the notion that Amy was found with her headdress perfectly intact, but if this was true, surely suicide seems much less likely. If Amy threw herself down a flight of stairs, it seems highly unlikely that, dying shortly afterwards, her hood would still be perfectly in position on her head. I am also persuaded by Aird's arguments that falling down a short flight of stairs is hardly a foolproof method of suicide. However, if Amy was melancholy or despairing at this time, as some sources may indicate, perhaps she did have a motive in wishing to end her life prematurely, particularly if her marriage was unhappy, as possibly the case. Out of all the explanations, however, I believe that suicide is the least likely theory. This leaves accident, murder, or illness. An accident is perfectly possible, but again, we are left with the simple fact that a short flight of stairs would not ordinarily kill a person. Therefore we must consider Aird's argument that Amy's body, because of the malady of her breasts, was weakened considerably, and so a short flight of stairs which, though usually would not result in death, may have caused her death if she was more fragile and physically vulnerable than a 'normal' person would be. This was the verdict recorded after her death, and many historians have suggested that it is what happened. Thus accident and illness are intertwined to provide an explanation, tragically, of accidental death. A more unsettling interpretation is possible. If one literally accepts the Spanish ambassador's comments, bearing in mind that ambassadors occasionally spoke little to none of the language in the court in which they served, relied on informers, and were frequently deceived by officials and courtiers, it is possible to believe that Amy Dudley was murdered, either by Cecil's agents or Dudley's agents. I have to agree, however, with modern historians who argue that Dudley would not have dared have his wife murdered, as the scandal would almost certainly have meant that the Queen would not have dared marry a man who would only bring controversy and even ridicule to her status. But desperate people do desperate things - if Dudley was so determined to marry the Queen, and only saw his wife as an unnecessary complication, who knows what he might have done? To conclude, it is impossible to know what really happened. On the basis of the evidence, I would tentatively conclude that Amy's death was caused by both her breast cancer and an accident; ie. if she had been physically healthy, and had fallen down the stairs, she would not have died, but in tragic circumstances, when her body was physically much more fragile, a simple fall led to her death due to the thinning of her bones. I believe that we can reject suicide as a likely explanation. It is possible that she was murdered, but if one believes that much of the evidence we have for this theory is based on hostile Catholic sources which openly vilified both the Dudleys and Queen Elizabeth, this theory becomes much less tenable. Therefore, I would suggest that accidental death, acting in conjunction with breast cancer, caused Amy's death, but we cannot rule out murder. Simon Adams, 'Amy Dudley, Lady Dudley (1532-1560)', Oxford Dictionary of National Biography (2008), online edition (Last accessed 13 December 2012). Ian Aird, 'The Death of Amy Robsart', The English Historical Review 71 (1956), pp. 69-79. James Gairdner, 'The Death of Amy Robsart', The English Historical Review 1 (1886), 235-259. James Gairdner, 'Bishop de Quadra's Letter and the Death of Amy Robsart', The English Historical Review 13 (1898), pp. 83-90. Wikipedia for a general overview.